“Are you a good sleuth?” The headline teased, from the Lowell Sun’s front page. One hundred years ago, on Saturday, September 21, 1912, the newspaper invited all would-be sleuths to Lowell’s Merrimack Square (today’s Kearney Square) that night, at 8 PM, ‘sharp’. One lucky sleuth, they claimed, would win $100 ($2300 in today’s dollars) if he or she were the first to find a money order hidden somewhere within Lowell’s city limits, within the following 24 hours. Hundreds turned out for the contest, which was overseen by three men: a Lowell Sun representative, Lowell Commissioner of Finance James Donnelly, and Henry Savage, proprietor of “The Million”, a comedy set to open at the Lowell Opera House a week later. At 8 PM, the three men would race their Buick out of Merrimack Square to find a place to hide the $100 or, more precisely, an order that the lucky finder could convert into $100. The only rule: the $100 order had to be hidden somewhere within the city limits. Admittedly, finding a piece of paper that could be hidden anywhere within Lowell’s 14.5 square miles is a pretty tall order. The Lowell Sun placed some conditions that made the contest a little bit easier. The $100 order would speed away, at 8 PM, with the Buick leaving Merrimack Square. Contest rules mandated that the men flash the order from the car before leaving. Anyone participating in the contest was free to follow them, for as long as they could. Those on foot and bicycles lost the Buick first. Pursuers on motorcycles lasted only slightly longer. The other cars lasted the longest. 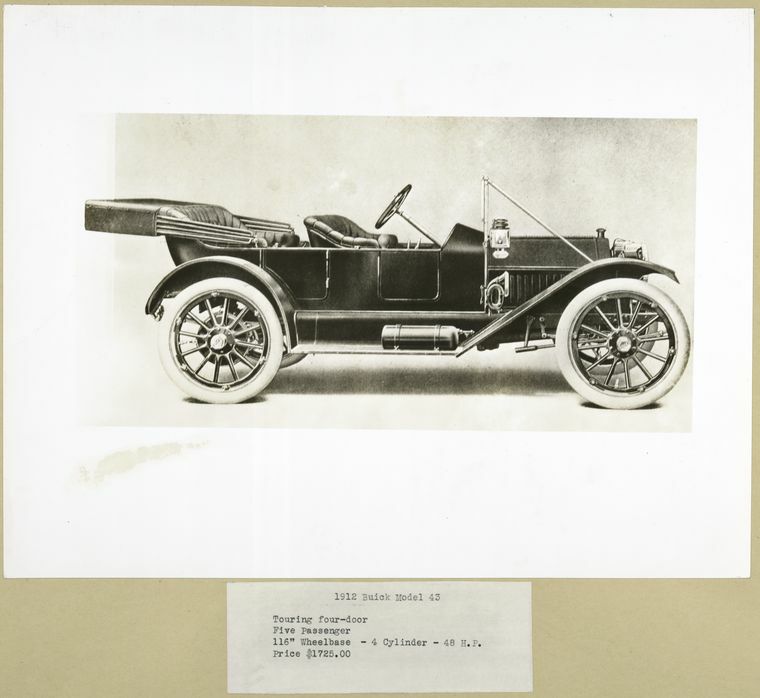 After the contest leaders in the Buick lost their pursuers, they would hide the $100 order . . . just about anywhere. Contest rules teased that the money could be hidden in a tree, behind a chimney, on the roof of a house, in a manhole, on an abandoned wagon, or perhaps in an awning on a public street. The $100 order had to be found within the first 24 hours, before 8 PM on Sunday, or its value would decrease to $75. Twenty-four hours after that, the value would drop to $50. On that Saturday night (and the following Sunday), hundreds searched every corner of Lowell for the money. And it did, indeed, remain hidden. By Monday, the Sun stayed true to its word, retrieved the order from its hiding spot, and again flashed it from the Buick as it sped away from Merrimack Square that night in pursuit of the next hiding spot. The inspiration for the contest came from “The Million”, a comedy that would come to the Lowell Opera House a week later. Coming off a wildly successful run at the Majestic Theatre in Boston, “The Million” featured “a bunch of cops, a struggling young doctor, an artist’s model, a young actress, a burglar, and others” all pursuing a million dollar prize. In ten short minutes that Monday, the Buick had again lost all pursuers, and within 45 minutes, the order was hidden in the steps leading up to the Kasino dance hall, to the side of the fourth step, to be exact. And, again, it was never found. The reporter who hid the $100 order, from the Sun, watched as a man sat on those stairs that afternoon, running his foot along some grass, but never finding the order. By Tuesday, the $100 order still hadn’t been found, and the automobile had eluded the pursuers twice. The pursuers again attempted to follow the Buick in their own autos, motorcycles, bicycles, and even afoot. The Buick first sped down Central, and over Prescott, along Merrimack, and up Central. One car vigorously pursued the Buick longer than the others. But, as the Buick climbed the hills, its driver noticed that their pursuer lost ground on the inclines. The Buick’s driver exploited this advantage by taking hills until it had lost even this last car. 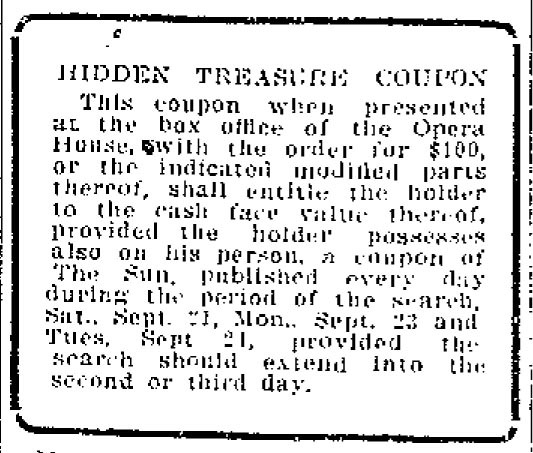 After the $100 order remained hidden through Tuesday, the Sun printed its best clue yet. The clue promised that “the money is in the very heart of the city and in an exceedingly easy and simple place of concealment.” The order, now worth $50, was written on pink paper and, according to the clue, hidden on Central Street, between Merrimack and Tower’s Corner. The clue continued to say that the order was enclosed, so that it would be safe from the weather, and hidden in a ‘very open spot’, but in an “inaccessible crevice”. In the end, the $50 prize was eventually found. The winning sleuth was a Marshall Street resident named Nelson La Porte. Nelson had arrived in Lowell just two weeks earlier, looking for work. On the night of Monday, September 23, he went to the Kasino dance hall and waited with the rest of the crowd for the Sun reporter who carried the money order. His searching efforts were not fruitful that first night. But, he returned the following night and began his search of Central Street. After what he thought was a thorough search, he called the Sun’s office and claimed that the whole search was bogus and that there was no hidden money order. The Sun told him to keep looking. He did, and searched all of Central Street again, from Tower’s Corner to Merrimack Street. He searched the sewers, the cigarette boxes, and even all of the signs. When he reached the sign belonging to Joe Haley’s barber shop (in the Central Block), he found the order, now worth $50. He rushed to the Sun Office and claimed the reward. La Porte claimed he was ‘dead broke’ and welcomed the $50 as a ‘godsend’. La Porte received his $50, at the performance of “The Million”, from a member of the company. The contest, which drew the interest of hundreds in the Greater Lowell area succeeded in drawing interest to “The Million”, which opened little more than a week later. In retrospect, it seems genius in not only its concept, but its close tie with the plot of the comedy. It’s hard to imagine such a contest happening today, with cars, motorcycle, bicycles, and even people racing through downtown streets in pursuit of a piece of paper worth something north of about $2700. What a rollicking promotion ;-> I wonder if my teenage grandfather and his brothers participated; sounds like it would have been hard to resist. I wondered if my own grandparents were there. $100 was a considerable sum in those days!